For more than two decades from early 1990, Glenn Mitchell lived a life that many envied. As a sports commentator for the ABC, and married to fellow sports broadcaster, Karen Tighe, he travelled the world covering elite level sport. Not long after joining the ABC legendary broadcaster, George Grljusich dubbed him “The Oracle” due to his encyclopaedic knowledge of sport. During his tenure with the national broadcaster Glenn commentated on four Olympic, four Commonwealth and two Paralympic Games. 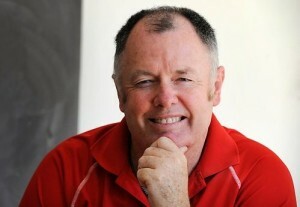 As one of the ABC’s senior cricket commentators he called over 200 international matches, covering 13 overseas tours. Back home, he commentated more than 900 AFL and WAFL games, was the host of the iconic Saturday Sportstalk, and throughout his career commentated more than 20 different sports on both radio and television, including world championships in triathlon, cycling and water polo. In 2000 he was awarded the Australian Sports Medal by the Governor-General for his contribution to sport, one of numerous awards he garnered during his broadcasting career. But all through this period in the public profile, Glenn was a sufferer of mental illness. In late-2006 he finally realized he needed medical help for his condition. Thus started a long and complex journey of self-analysis and various medications as he endeavoured to overcome his illness. Despite having made progress a confluence of events in early 2011 saw him descend into a highly depressive mental state that resulted in him inexplicably resigning his position at the ABC and making an attempt on his own life. It was the blackest of periods in the life of a man who appeared to have everything to live for. With the support of his wife, family, friends and doctors, he was able to fight back from the brink of despair. While he forfeited his dream job, what he gained by way of his rehabilitation was far more important. After overcoming his personal demons and reshaping his life, Glenn now aims to try and prevent others from enduring the torturous path he did by candidly speaking about his own journey. It is a story laced with poignancy, humour and, above all, hope for those who suffer the anguish of mental illness or know people who do. Glenn’s goal is to encourage everyone who is or has been touched by the scourge of mental illness that help is at hand. His story is one of inspiration and shows that with the right help and persistence there is a light at the end of the tunnel. Since resigning from the ABC, Glenn has continued to freelance in the media. He currently presents the weekday breakfast show on Perth-based, Curtin FM. He has undertaken commentary work for the Seven, Nine and Ten Networks and is also a regular contributor to sports programs on BBC 5 Live and was a long time panellist on Sky News’ Sportsnight program. He has commentated Test cricket on both radio and television for the South African Broadcasting Corporation, called AFL football for Perth radio station, 882 6PR and currently commentates WAFL football on KIX Digital, taking him to more than 1,100 games behind the microphone. Additionally, Glenn has written columns for both The West Australian newspaper and The Drum on the ABC website – abc.net.au/news/thedrum. He writes regular columns for the sports website, The Roar – theroar.com.au – as well as appearing weekly on various radio stations around Australia where he discusses issues in the world of sport. A highly sort after MC, conference facilitator and after dinner speaker, Glenn is also heavily involved in the community. He is an ambassador for the Institute for Respiratory Health, Lifeline and OneLife. "Change your thoughts and change your world"